How Long Do You Cook Large Meatballs in a Convection Oven? Meatballs were originally a budget-stretching food for large families. Breadcrumbs, oatmeal or even torn fresh bread served as a filler so ground meat went further. Meatballs are still a smart choice for quick and inexpensive meals -- especially when you bake them in a convection oven. Large meatballs take longer to bake than small ones, but convection baking can get them to the table sooner. Traditionally, meatballs are fried in a skillet on the stovetop, but this method adds fat to the dish, makes an oily mess and requires you to keep watch over the pan. Cooking meatballs in an oven -- especially a convection oven -- is faster, cleaner and the meatballs have less fat. Preheat the oven to 325 degrees Fahrenheit, or 25 F lower than the recipe suggests. In convection cooking, a fan circulates heat throughout the oven more efficiently than a traditional oven would. Because of this, you can reduce the heat by 25 F and also reduce total cooking time by as much as 25 percent. Place the meatballs on a rimmed baking sheet, spacing them 1 to 2 inches apart. How much time oven-baked meatballs take depends mostly on the size of the meatballs. 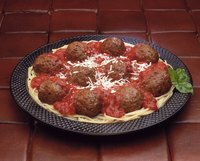 A tray of 2-inch meatballs baked in a convection oven would take between 15 and 20 minutes. Extra large meatballs may take 30 to 45 minutes, or almost the amount of time it would take to bake a meatloaf. Set the timer initially for 15 minutes and add more time, as needed. The meatballs should be firm, browned and completely cooked through when done. You can get a good idea of doneness simply by looking at them, but to ensure that the meatballs are completely cooked through, insert a thermometer into the center of them. The meatballs are done when the thermometer registers 160 F, according to the U.S. Department of Agriculture. During processing, ground meat is exposed to more air -- and potentially more bacteria -- than whole cuts of meat. Because of this, the USDA advises it be cooked to 160 F to reduce the risk of foodborne illnesses. Because you don't turn oven-baked meatballs as you would those fried in a pan, they may not be completely round, but may be slightly flat on the bottom. Chances are, no one will notice this, especially if you're serving the meatballs in sauces or sandwiches. Serve the meatballs immediately. Place any leftovers in a covered container and refrigerate them at 0 F within two hours. In warm weather, refrigerate them within one hour. Use the refrigerated meatballs within four days. You can also freeze meatballs for up to three months. To thaw them, place them in the refrigerator overnight or microwave them. Reheat them to 165 F.